Do bloggers get sick days? Here it is Wednesday, the day of the week I usually post something, and yet, I don’t feel much like sitting at my computer. For several days, I’ve been fighting a cold, and yesterday, the cold started fighting back even harder by moving into my lungs, firing up a fever and making everything generally pretty achy. So if you don’t mind, I’m going to take today off. 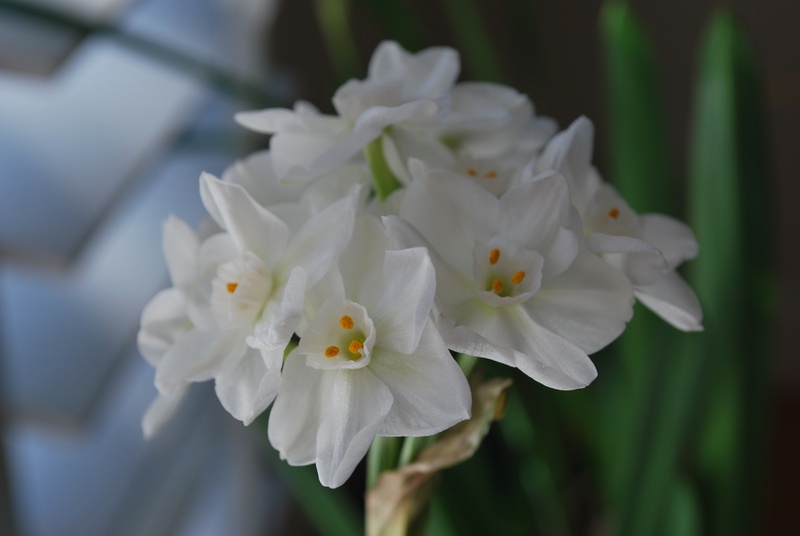 A paperwhite in bloom brings springtime inside, even in winter. This entry was posted in flourishing tree and tagged colds, Irish blessing, paperwhite, sick days, spring fever, springtime, winter by hopesquires. Bookmark the permalink. Hi, Tracey — I am finally feeling better (though not 100% yet). Thanks for your kind words about my “sick day” blog, too. It didn’t feel like much work because the picture was one I had taken already, and the poem wasn’t mine. I’m glad you enjoyed them. Hope you feel better soon – it has been a hard winter on most of us. Thanks, Patty. I’m finally starting to feel better! Hope you are feeling better today. Just want to let you know I wrote a little book about how to stop colds as soon as they start, in case you want to make this your last cold.